Manor Vail Lodge, a destination resort. This brand new three bedroom residence is located in the heart of Vail Village, adjacent to Golden Peak. Ski to either Golden Peak or Vail Village and walk home! This comfortable condo has three bedrooms, two with king beds and the third a bunk room with a captain bunk with twin and double bed. 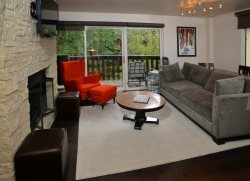 Enjoy a fire in the living area with the flat screen tv and comfortable seating for your entire family. Brand new gourmet kitchen and washer and dryer and balcony with gorgeous mountain views. This residence is awaiting your arrival. Nightly prices vary from $650 to $1800 per night. This residence is paid by check only. This property is pay by check only.